Husbands, love your wives, just as Christ loved the church and gave himself up for her, in order to make her holy by cleansing her with the washing of water by the word, so as to present the church to himself in splendor, without a spot or wrinkle or anything of the kind– yes, so that she may be holy and without blemish. In the same way, husbands should love their wives as they do their own bodies. He who loves his wife loves himself. For no one ever hates his own body, but he nourishes and tenderly cares for it, just as Christ does for the church, because we are members of his body. Last week we talked about the modern family and the biblical family, and I tried to show that family life today, even that of the traditional family—what many call the biblical family—looks very different than what a family looked like in much of the Bible. This last one is the main movement we see. 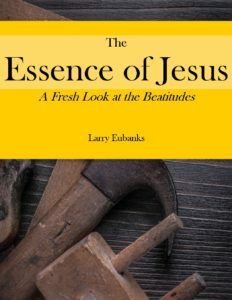 In fact, if you want to find a key that will help you interpret the Bible and understand what is happening from Old Testament to New Testament, this is it: a movement from the excesses of power to the extravagance of love. Thus the move from patriarchy to equality is a move from the power of the patriarch in which one male had all the power and everybody else had to fall in line; to the equality of love relationships in which all members of the family, even the slave, are treated with dignity. And the movement from contract to covenant is a move from a relationship of power to a relationship of love which results in mutual responsibility and mutual benefit. There’s another movement in the Bible that I didn’t talk about last week, but it’s an expression of the same movement, and that’s the move from polygamy to monogamy. See, not everyone could have more than one wife. Wives are expensive. Just as in the Antebellum South only the wealthy and powerful actually owned any slaves, so also in biblical days did only the wealthy and powerful have more than one wife. Last week I mentioned some of the men in the Bible who had multiple wives; did you notice that most of them were kings? They had the wealth and the power. As wealth and power increased, so did the number of wives. Abraham wasn’t all that wealthy or powerful—he had but one wife. Jacob ends up quite wealthy—mostly because of his chicanery—with lots of servants, herds and flocks, and two wives. David ends up with six wives, but not until he is made king. He gets his most famous wife, Bathsheba, because of his wealth and power, stealing her from another man whom he subsequently murdered. And then there’s Solomon, the wealthiest and most powerful of all the kings of Israel. He had a bunch of wives. And don’t think he had any of their interests at heart when he married them. It was all about what his marriage to other men’s daughters could accomplish to Solomon’s advantage. Last summer Pam and I were visiting a friend and we went with her to church, where they were doing a series on marriage based on the Song of Solomon. The pastor used Solomon and all the beautiful exchanges there are between him and his beloved, presumably his wife. I mean, right? Think they might have felt a little left out? Really, given what we know about Solomon, do we really want to hold him up as the ideal of committed, monogamous marital love? Isn’t it possible that Song of Solomon might just be a little bit ironic? Polygamy was about power, not at all about love. The move in the Bible towards monogamy is a move from power to love, but it doesn’t necessarily go all the way. We have to take it the rest of the way. A monogamous marriage can be a loving relationship, but not necessarily so. It can be a relationship based on power. So what Paul is trying to get us to do is to move our monogamous marriages from relationships of power to relationships of love. This is true of all relationships, not just marriage, which is why Paul makes the same move when talking about the relationship between father and children and between master and slave. All relationships are a struggle between power and love. When one increases, the other decreases. Think of it as if power and love are on a see-saw; when one goes up, the other goes down. In any marriage, the one who loves the least has the most power. Let’s use an extreme example to illustrate this. In abusive marriages, there is very little love. A man who beats his wife cannot really claim to love her. She may love him, which is perhaps why in her mind she ought to take his abuse, but you cannot claim to really love a woman if you are beating her. Manipulation is also an expression of power. If a man loves his wife and his wife doesn’t much care, she can manipulate him and make him do almost anything she wants and make it look like he wants to do it. So what we want to see in our marriages is for power to decrease while love increases. We aren’t looking for balance here—we aren’t looking to have that see-saw kind of hanging in the middle. That’s no fun. No, we want to see power all the way down here and love all the way up here. This is the biblical ideal for marriage. What means real trouble in a marriage is when the struggle is no longer between power and love, but is all about power. When the relationship has devolved into nothing than a power struggle, the marriage is in crisis. Let’s talk about power struggles. What are some signs that you are in a power struggle in your marriage? This is not just about some argument you may be having. A marriage that is in the midst of a power struggle is essentially one long, ongoing argument, the objective of which is not a mutually beneficial resolution, but victory. · You accuse each other of attacking or becoming defensive. You aren’t listening because while they are talking you are plotting your next move. You listen enough to plan your comeback. See, the reason we want to win is we don’t want to change, and the winner is the only one who doesn’t have to change. If you lose, you have to change. If you find a mutually acceptable resolution, you are going to have to change. But the victors are vindicated in doing what they’ve always done. So you look at this list, and one thing becomes clear: in power relationships, there are winners and there are losers. If being right is your objective, then you will either achieve it and win, or you won’t, and you’re a loser. If you win, then your spouse loses, and if your spouse wins, then you are the loser. But here’s the thing that you have to see: if your spouse loses, then you’ve lost. Right? Isn’t that what Paul is saying about loving your wives as your own body? No one hates their own body but nourishes it. If you don’t nourish your body, if it becomes unhealthy, you lose. Just think for a second when you’re on the losing end of a power struggle—how do you react? You get resentful? Get sullen, withdrawn, pull away? Maybe you spend time and energy plotting ways to make sure that doesn’t happen again. That can’t be healthy, not for you as a person, and certainly not for a marriage. In a marriage that is a power struggle, there is a winner and there is a loser, but even the winner loses. In love relationships, there are only winners. In a marriage of mutual love, respect, caring, of willing sacrifice for the sake of your spouse, everybody wins. There are no losers. So let’s talk about how to have a marriage in which love wins. This is what a lot of Christians call a Christ-centered marriage. Before I go into the list I have to say this: in a Christ-centered marriage, you still have to work at the relationship. To listen to some people talk about Christ-centered marriages, the only thing that needs to happen is for the husband to concentrate on developing his relationship with Christ, and for the wife to concentrate on developing her relationship with Christ, and the marriage will be fine. If he’s growing in his relationship with Christ and so is she, then their marriage will be great. I certainly want you each to work on your relationships with Christ, but you need to work on your relationship with each other. Otherwise you run the risk of just being two strangers having personal devotionals under the same roof. · Stop doing what doesn’t work. If you’ve been nagging for ten years, it obviously isn’t working, so stop it. If you’ve been complaining about the same thing, obviously complaining isn’t working, so stop it. If you’ve just withdrawn and not spoken up so the issue keeps coming up, stop withdrawing and being quiet. If you’ve been having the same argument for 30 years, please stop! That’s what Paul says. Instead of seeking first after your own interest, seek after your spouse’s first. Put their best interests at the top of your priority list. Ask yourself what specific things you could do to help them flourish as a person, as a Christian, to help them be the person they are becoming. Not to change them, mind you. You aren’t out to change them, you are out to help them be what they want to be. Then, after you ask yourself this question, ask your spouse. Don’t think you can come up with answers yourself, actually ask your spouse. You probably already know the answers, because it’s what they’ve been saying for years. Help with the laundry. Stop yelling. Give me some time. Talk to me. · What needs to happen so that you can do it? Stop doing what doesn’t work, come up with a new plan based on your spouse’s input, decide what needs to happen to make room for the plan, and then put the plan into action. Don’t just think about it, do it. The biggest obstacle you are going to face is fear. Fear is why we do power plays. I’m afraid that if I don’t take care of my own needs and desires, no one will. I’m afraid that this person I trusted to provide for me what I can’t provide for myself won’t give it to me, or will only give it with strings attached. So I resort to power plays to get them to give me what I need. The reason we don’t trust is because it’s scary. The reason we don’t love is we’re afraid. That’s why the Bible says that perfect love casts out fear, because fear is the biggest obstacle we face in giving love and receiving love. I pray that the perfect love of Christ will cast out your fear so that you can have the marriage you and your spouse so desperately need and Christ so earnestly desires for you.